For years preparing teeth for fillings or other restorations has required the use of a drill. Although quite effective in removing decayed structure and preparing the tooth for bonding, it usually requires a local anesthetic. That and the noise it generates can be unsettling for many patients. 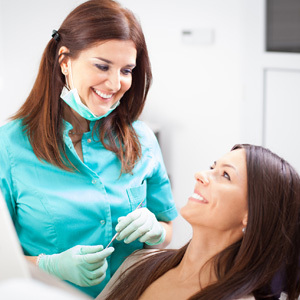 In recent years, a different type of technique known as “air abrasion” has increased in popularity among dentists. Known also as “particle abrasion,” the technique uses a stream of fine particles to remove decayed tooth structure and is less invasive than the traditional drill. Although the technology has been around since the mid-20th Century, recent developments in suction pumps that remove much of the dust created have made it more practical. It also works well with new natural-looking bonding materials used for tooth structure replacement. The fine particles — usually an abrasive substance like aluminum oxide — are rapidly discharged through a hand-held instrument using pressurized air aimed at affected tooth areas. Decayed teeth structure is softer than healthier tissue, which allows air abrasion to precisely remove decay while not damaging the other. Besides removing decay or abrading the tooth for bonding, air abrasion can also be used to minimize stained areas on surface enamel and to clean blood, saliva or temporary cements from tooth surfaces during dental procedures. It’s also useful for smoothing out small defects in enamel or aiding in sealant applications. It does, however, have a few limitations. It’s not as efficient as the traditional drill with larger cavities or for re-treating sites with metal (amalgam) fillings. Because of the fine texture of the abrasive particles, affected teeth need to be isolated within the mouth using a rubber dam or a silicone sheet. High-volume suction must be continually applied to capture the fine particles before the patient swallows them or it fills the procedure room with a fine cloud of material. Still, while air abrasion technology is relatively new, it has clear advantages over the traditional drill in many procedures. As advances in the technology continue, air abrasion promises to offer a more comfortable and less invasive experience in dental treatment. If you would like more information on air or particle abrasion, please contact us or schedule an appointment for a consultation.